Posted April 18, 2018 by admin & filed under Car Repair. Limit distractions. 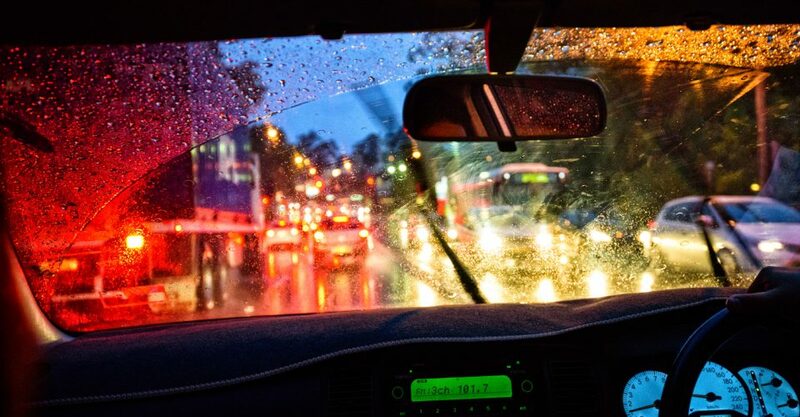 Unpredictable rain and other driver’s reactions require more of your attention. Turn off the radio, put away the GPS and concentrate on the roads. Don’t use cruise control – instead, pay attention to the traffic and stay alert so you can respond quickly to changing circumstances. Turn your headlights on. Not only do headlights help you see, they help you be seen. That can be more important when visibility is compromised by heavy rain. Don’t use the brights and blind oncoming traffic, but do turn on the lights so other drivers can see you more easily. Use your windshield wipers. This seems like a no-brainer, but if there are water droplets collecting on your windshield, your ability to see and react to road conditions is compromised. Be sure to kick on the defroster if the windshield begins to fog up. If the rain is pouring down so heavily that your wipers can’t keep off, find a place to pull over and stop. If you can’t see, you shouldn’t be driving. Avoid flowing water. If water is pooling and flowing across the road, find an alternate route. Flowing water can be extremely dangerous for your vehicle. You have no way of knowing how deep it is, how strong the current is, or what may be lurking below the surface. Your vehicle might lose traction with the road, run over a hidden pothole, damage the tires, or cause internal damage from the water. Avoid when possible, stop a safe distance away, and drive around the water. Slow down. Speed limits are set based on good road conditions. When the weather is bad and roads are wet, slow down to remain safe. Driving too fast puts your vehicle at risk of hydroplaning – losing traction with the road and floating above the water. If that happens, you have little to no control over where your vehicle goes. Even if you’re in a hurry, take your foot off the gas pedal. Remember brakes can be affected by water and take longer to stop your vehicle when it’s wet. Start breaking earlier and leave more distance between your vehicle and the others on the road. It’s better to arrive late and alive than risk your life driving too fast in the rain. Be sure to call us at 616-796-9929 if you have any questions concerns regarding springtime driving!